We are in the digital age. Management seems to understand this on a theoretical level, but they don’t appear to make the connection to their own company or organization. The digitization of analog content is essential to keeping up with the pace of today’s client demand and usability. Why Migrate to Digital Content? A key reason to convert your legacy content to digital formats is the preservation of history. Many of the videos, audio tapes, and films created early on in the history of your organization have a lifespan that is rapidly nearing the end. Though the average life expectancy for analog media depends on the format, in most cases those assets are nearing end-of-life. What does this mean? Much of the content created on analog media will soon be history. Digitization of the content makes it possible to preserve those invaluable resources and productions for the foreseeable future. Assets stored in less than ideal conditions face even more urgent action. 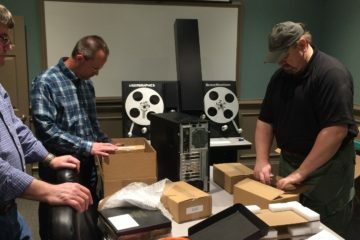 These archives – be it tape, film, or video – are vital to the preservation of your business or organization’s legacy. The significant majority of customers use digital media players like mp3 players, DVD players, smartphones, and tablets to view content. Migrating your content to digital format also gives you the opportunity to present your content to a wider audience via digital channels. The power of digitization allows you to share your content on a number of web platforms – including YouTube, social media, websites, blogs ­– allowing access to millions of potential viewers previously unreachable. By converting old films, tapes, and media to a digital format, you’ll be able to create documentaries, video infographics, digital timelines, and many other types of evergreen digital assets. When it comes to digitizing media collections, time is not on your side. The fact is there are more tapes in the world than there are machines available to transfer them. Content that exists only on magnetic tape is facing a game of musical chairs. When all of the decks of a given format are worn out, the music stops, and that content is lost forever. You may only get one shot at digitizing your collections. That’s why the most respected organizations in the world entrust this critical task to Preserve South. Our film scanner has arrived!